ca 400 - 390 B.C. Detail of one of the Dioscuri twins battling a Gigante from a painting of the Gigantomachia (War of the Giants). 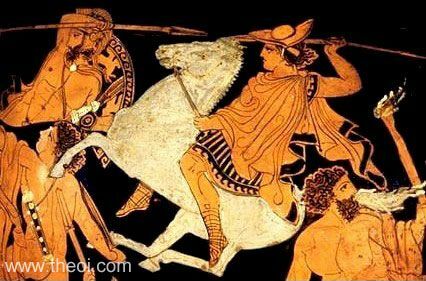 The demigod is depicted as a horseman wearing a petasos cap and brandishing a spear. His	brother	also appears in the painting (see other image).